Ristar, known as Ristar the Shooting Star, is a platform game published by Sega and developed by Sonic Team for the Sega Mega Drive in 1995. The game stars a cartoonish humanoid star who uses his hands to both move and combat enemies. It was originally released on the Mega Drive. A Game Gear version which features different levels than the Mega Drive version was also released in the same year. Ristar is unable to jump as high as most platformer protagonists do, but his jumps have a bit more hang time, meaning he stays in the air longer. By pressing the grab button, Ristar will stretch his hands forward, grabbing whatever is ahead of him. The player can make his hands go in any one of eight directions by combining the attack with any direction on the control pad, except downward while on the ground. When Ristar grabs an enemy, he will continue to hold it until the button is released, pulling himself to toward the enemy, causing them to collide, thus destroying the enemy. He can also grab walls and obstacles this way. Ristar's health is shown as four stars in the upper-right corner of the screen. Taking damage removes one star, and losing all stars causes Ristar to lose a life. Stars can be found throughout the levels, which replenish his health. During levels, the player will occasionally come across cranks with a star-shaped base that, when grabbed, they may be spun on to gain momentum and shoot off toward the edge of the screen. 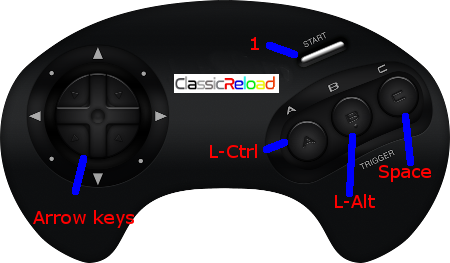 The player may control Ristar's speed and direction with the control pad. If he has enough momentum, Ristar will begin to fly with a trail of stars behind him. During these flights, any enemies that are touched will be destroyed and regular hazards will not deal any damage. When Ristar loses enough momentum, he will cease flight and drop to the ground, though his momentum will last longer from bouncing off walls than just flying straight. At the end of every level, a crank will appear for Ristar to fly from, and the higher Ristar is when he finishes the level, the more bonus points are earned. Each regular level also contains one special crank that Ristar can grab onto. Grabbing this makes him automatically spin and launch himself off the top of screen into a bonus stage. These bonus stages involve getting through an obstacle course in order to reach a treasure within a given time limit. Completing the level in a fast time will earn the player a continue. Their difficulty increases as the game progresses. When the game is completed, cheat codes are revealed depending on how many treasures are collected. Each planet consists of a mini-boss at the end of the first level, and a main boss after the second. Some of the minigame bosses involve puzzles, such as hitting enemies in the order they appear.